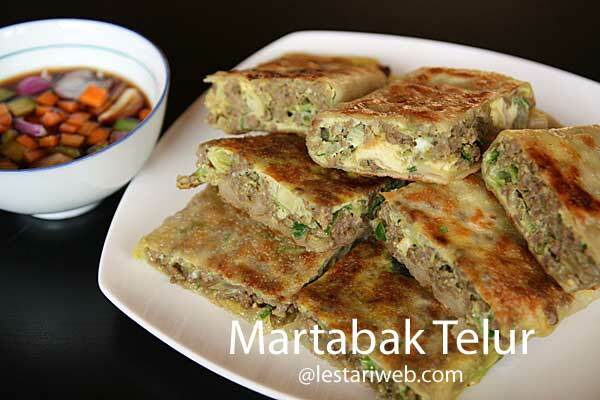 There are two famous Savory Meat-Pancakes in Indonesia, in Java we have Martabak Telur, in Sumatra called Martabak Mesir. At the first sight, this dish is similar to Prata from India. No wonder !!! History explains that Martabak is being brought & invented by Indian Merchandiser who have set foot in Indonesian archipelago & trade with local people hundred years back, even before the Dutch came to colonize most of the Spice Islands. As I mentioned on the first page of this site, Martabak is real proof of foreign influences that mark Indonesia's culinary today. To be honest I was not used to be a curried-dish lover, but since I eat martabak telur long time ago in Batam island, my tongue becomes more tolerant to this distinctive taste ;-). And on & off I make curry-based dishes to satisfy my curiousity. Anyway there are 2 options to prepare the Wrapper. You can experience the authentic way to prepare Martabak wrapper from self-made dough which I write & explain here in this recipe. Or you can just use filo pastry/dough which is available in the market when you prefer short-cut way or time-consumed is a big issue. The choice is yours ;-). Making the Dough-Wrapper: (Skip this steps if you use filo pastry dough). Mix bread flour & salt throughly in a bowl. Add a little water at a time, mix & knead with your hand until you get smooth & elastic dough. Add 2 tbsp oil to the dough, knead all over again until the dough is no more sticky. Put aside. 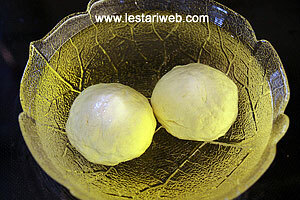 Divide the dough into two, make a tenis ball alike form. Saturate in vegetable oil for 2 hours. (Ensure all part of the dough are bathed in the oil. Don't worry, the oil will stay clean & you can use it again later). 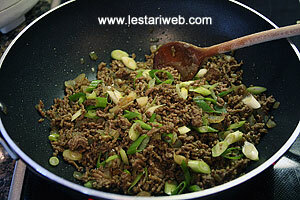 Making the Filling: Heat 3 tbsp oil, stir-fry the chopped onions & grinded garlic over medium heat until fragrant. 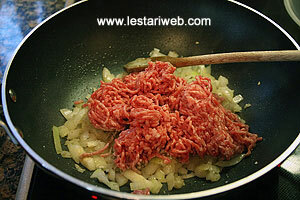 Add the minced beef, stir to mix & cook until the meat changing it's colour. Add pepper & curry powder, stir to mix. Adjust the seasoning, add salt & sugar to taste. 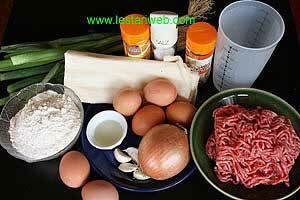 Cook until the liquid from the meat has evaporated & the beef becomes drier. 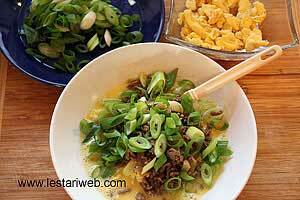 Add the half of sliced spring onions. Stir briefly until just wilted. Remove from heat. Heat 2 tbsp oil in a frying pan, beat 2 eggs with a pinch of salt & make scramble egg. Put aside. 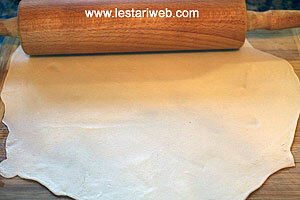 Preparing the Wrapper: (Skip this steps if you use filo pastry dough). Take one piece of dough, flatten with palm of your hand or press with a rollingpin. Hold one side of the dough and pull out the other side with your finger. Perform this step for all 4 sides alternately until you get a thin and transparent pastry. 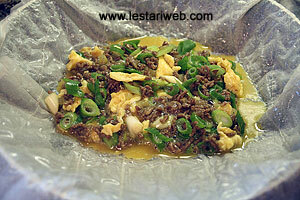 Preparing the Martabak: Beat 4 eggs in a big-size bowl. Add the leftovers spring onions & fried scrambled egg. Heat 3 tbsp oil in wide pancake of flat frying pan over low-medium heat. 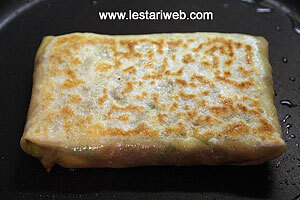 Put the pastry wrapper onto the frying pan, add half of filling evenly around the center of the pastry. Fold the leftover wrapper from the 4 sides like folding an envelope or just fold in your way that all the filling is well covered with the wrapper. Turning it over several times, until the egg is being set & the whole pastry is hot & lightly brown. Repeat the process for second pastry. Pat dry with kitchen paper or put them on the towelled tray to let them drain. Cut in serving portions & serve hot with the sauce. If you use filo pastry you may cut the wrapper in a smaller pieces, add less filling to make many small individual Martabaks.